I took her out this morning to the Marlborough Forest, to the cover I call Schäfer‘s Wood. We set out at 7:00 am and arrived on time at 8:00 am. It was cool, about 1 C and there was frost on the ground. I noticed a pickup truck parked in the same spot I park and wondered if someone else had already swept the cover ahead of us. I did not notice a dog crate in the back of the truck so I thought maybe they did not have a dog. It occurred to me they might not even be hunters for that matter. One of the realities of hunting on Crown land is everyone is free to use it year round. Given this possibility, I am reminded of how crucial it is to conduct yourself ethically and safely when you are out hunting. I let Hera out once I had my blaze orange vest on over my jacket and my shotgun out of the case. Off we went, checking the edges at Schäfer‘s Wood in hopes of turning up some grouse and woodcock. The area is rich in berrying shrubs and moist lowlands that attract both grouse and woodcock. It took us an hour to complete our sweep and all we turned up was one wild flushing grouse. I heard the flush and a bird broke cover. I brought my shotgun to bear on the bird and when I saw it was a songbird, did not fire and calmly slipped the safety back on my shotgun. It is so important to properly identify your target before shooting. As we walked up to the car, a man drove up in a truck. He stopped to ask if I had any luck. We chatted briefly and I surmised that he is a road hunter. He was surprised when I told him my dog points birds that I flush then try to shoot. He is content to drive the forest roads in hopes of spotting a grouse on the road, then stopping to ground swat it. To each his own. 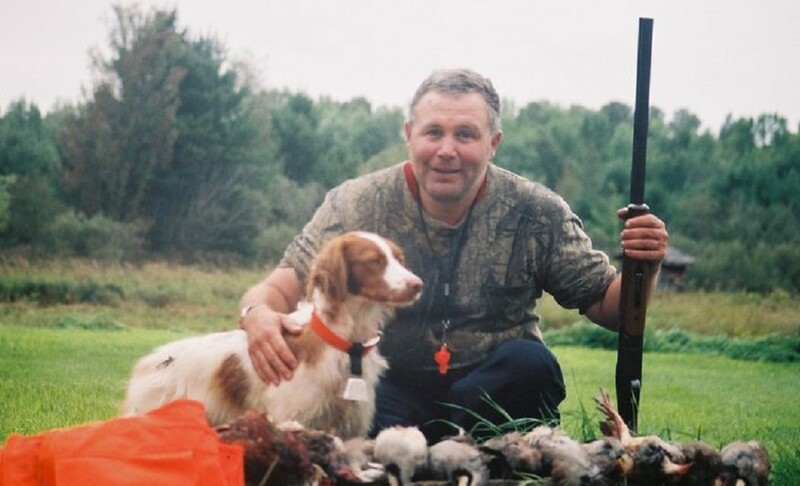 I certainly ground swatted plenty of grouse when I started hunting in my mid-teens. These days, however, I prefer taking birds on the wing. I put Hera on board and we drove to Lester’s Square, the next patch of cover we hunted this morning. En route we came across a man with a thick European accent with a very young Pointer. If I heard him correctly, he said the Pointer, a male, was three and half months old. The dog was shaking and had his tail between his legs. He had a bell and a shock collar on. If the dog was really that young, I wondered what the man was thinking. Has the dog been properly gun conditioned? What are you expecting from a twelve week old puppy? The man said a friend of his was hunting up the road. He added that he had not seen many woodcock and the few he saw were in very thick cover. You never know what you will find in the Marlborough Forest. I found my usual parking spot at Lester’s Square vacant and happily pulled in. I set out with Hera along a tried and true trail leading to a stand of cedar where woodcock are often found. Sure enough, Hera locked up on point and as I made my way around and ahead of where she remained on point I flushed the bird, a woodcock. Though it flushed in a dense clump of cedar I found the mark and downed the bird cleanly. I was well pleased as Hera remained staunch on point this time. I praised Hera heartily as I retrieved the downed woodcock and we continued our sweep of the cover. I found the cover drier than I expected, but there was residual moisture in portions of the lowland bogs. Woodcock are trickling through in spite of the dry conditions too. This stand of cover at Lester’s Square attracts woodcock most seasons. We pressed on, working our way to a stand of aspen that routinely holds woodcock. Sure enough, Hera bumped a woodcock as we made a second pass. I heard it flush, but did not see it. Hera found the fresh scent and searched enthusiastically for the newly departed bird. We moved on, covering an area that is usually very wet only to find it completely arid. In spite of this, Hera locked up on point and remained on point as I walked it up. A woodcock flushed and I got off a shot. I saw the bird change direction and thought I might have hit it, but a thorough search of the area with Hera turned up nothing. I chalked it up as another spectacular miss. Still, I was uplifted by Hera’s staunch points and hoped she was back to her old self. It was warming up and as there was no water for Hera to cool off in, I decided to call it a morning. It was after 11:00 am by then so we headed back to the car. On the way, we swept a partially overgrown field with clumps of cedar and pine. It was dry as a bone, but Hera locked up on point on a patch of young cedar and pine. I saw her standing like a statue with that determined look she gets when she has a bird in view and walked in for the flush thinking “a brace of woodcock will be a great way to end the morning.” Then, as I neared her but still maybe five yards from her, she broke point and bumped the woodcock allowing it to make good its escape. Had she waited for me it would have been a golden opportunity. Hera and I have some work to do this season. I want my stalwart Brittany back pointing and remaining staunch as I walk up her points. At five years old, Hera remains a work in progress. Good hunting and thanks for reading and commenting.